For a PDF of this report, click here. Washington State should still be seen as in contempt. 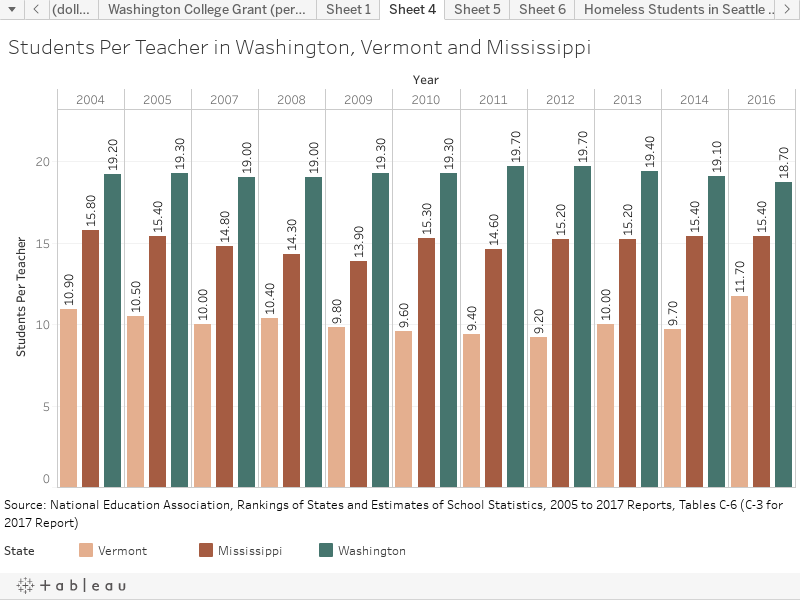 Washington is one of the five worst states in terms of class size. Vermont, which has the best student/teacher ratio in the country, has seven fewer students per class with a per capita income that is $4,400 less than Washington’s $55,718. Mississippi, the poorest state in the country with a per capita income of $36,296, has three fewer students per teacher than Washington. From 2004 through 2016, through economic growth and severe recession, we have barely made a dent in the student-teacher ratio, even since the State Supreme Court’s McCleary Decision of 2012. According to the Education Week Research Center’s annual Quality Counts report, which combines 39 indicators for quality in K-12 systems throughout the country, Washington ranks 20th in education quality. Per capita income in the states outperforming Washington ranges from $45,000 to $70,000. The average per capita income, weighted by population,  for these states is $56,610,  $892 more per person than Washington’s. For Washington to obtain the class size standards of the 19 states ahead of us would require about $3.4 billion a year, the equivalent of over one-third of the 2017 K-12 budget for the state. To reach the level of the six states that earned the top grade of “B” in the Quality Counts survey – Massachusetts, New Jersey, Vermont, New Hampshire, Maryland, and Connecticut – would require an investment of $4.2 billion a year, an increase of over 45% in state investments for K-12. If the Legislature intends to meet its paramount duty, it must increase teachers’ salaries to be competitive nationally, regionally, and among other professions with similar education and skills. We are seeing a teaching shortage across the nation. Enrollments in educator preparation programs are down – indicating that teaching is not competitive among similar professions. Yet average salaries for Washington teachers are 92% of the national average in salaries. Not only do we have to compete with other states in trying to meet our own teacher shortage, but we also have to make sure the pay is competitive enough that prospective teachers don’t choose a different profession. Washington State’s funding for higher education peaked in 1980. That year, tuition and fees at the University of Washington and Washington State University were less than $2,000, at the regional universities less than $1,800, and at the community colleges less than $900. Slowly tuition crept up, with the pace accelerating in the past two decades. In 2017, the state supported only 43% of the cost for education at the two universities, while tuition accounted for 57%. At the community colleges, state support has fallen from 70% to 59%. To return to the funding levels of 1980, the state would need to contribute another $1.2 billion a year. In the past decade, political leaders have realized that the time in a child’s life from birth to kindergarten creates the platform, self-confidence, and social skills necessary for a child entering elementary school. Yet our state neglects the financing necessary for high quality early learning and child care for the vast majority of children in our state. Our current system of poverty-level wages, rapid turnover, and few incentives for education for early learning teachers and caregivers all add up to compromising the health, well-being, and future of Washington’s children. Author’s calculations. 2014 wages calculated in 2015 dollars. 2017 minimum wage + 25 cents. Considering K-12 education, higher education and early learning, our state is short by about $7 billion a year –$1,000 per resident per year – compared to what would be necessary to meet our paramount constitutional duty for the education of all children, to build the early learning foundation for their success in K-12, and to enable them to follow their aspirations for higher education. What has the Legislature done? They have clothed an incremental and insufficient funding increase for K-12 education with aspirational promises for future funding. This past July the Legislature increased funding for basic education by $1.6 billion for the 2017-2019 biennium. While congratulating themselves on funding education, the Legislature failed to fund current public responsibilities for higher education, and instead put in place a 2 percent increase in tuition at our state’s higher education institutions. And while the focus was on K-12, the Legislature again failed to fund a career and wage ladder for early learning teachers and caregivers, a wage ladder that the Legislature voted into state law in 2005. As a result, the teachers and caregivers of our youngest children work themselves into poverty. This is not a prescription for high quality early learning. The Legislature has again failed the students, the children, the parents, the constitution, and its own laws in refusing to fully and amply fund education. They have sent a message to our children and their parents that our state is in fact, regardless of rhetoric, unwilling to fund the educational building blocks for full participation in our society and economy for all residents in our state. 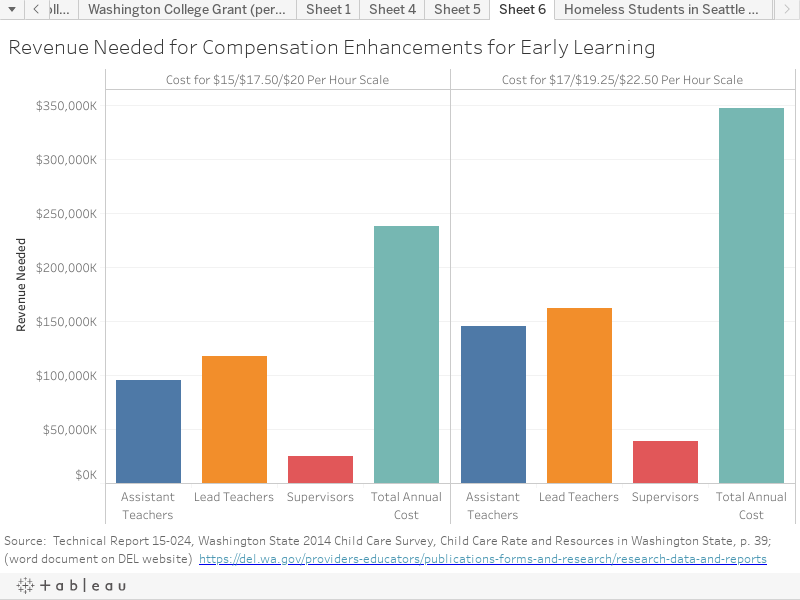 Author’s calculations from (1) http://www.eoionline.org/budget/#minor/Public+Schools/2017/list, (2) http://www.k12.wa.us/DataAdmin/enrollment.aspx, (3) http://www.nea.org/assets/docs/2017_Rankings_and_Estimates_Report-FINAL-SECURED.pdf I took the NEA data on class sizes for other states and compared them to Washington. 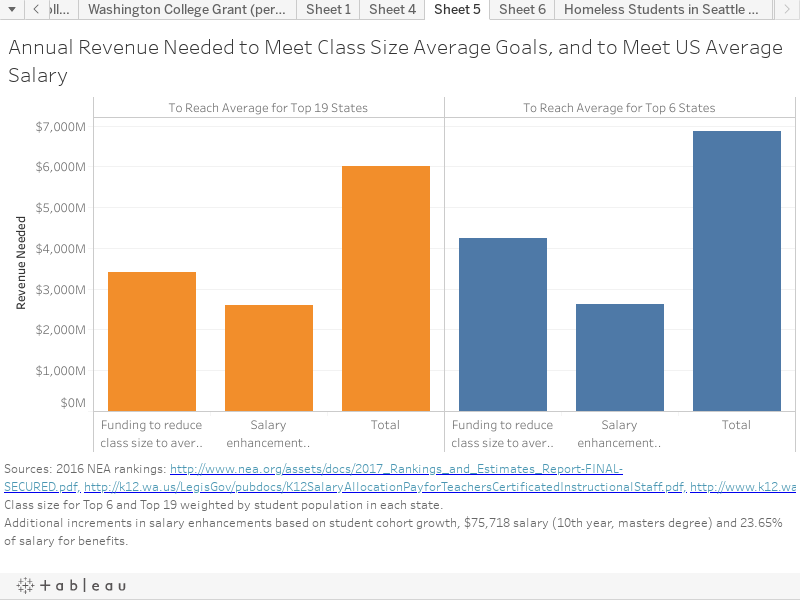 The Washington data includes local funding, so estimates for needed new revenue are based on class size from all funding sources (that is, local school districts as well as the state). If the state takes over the local funding, as is currently constructed, sort of, with the new legislation, then the state portion would have to go up and obviously the local portion would go down – but the overall funding estimate would remain roughly the same. Bureau of Economic Analysis, op. cit. http://k12.wa.us/LegisGov/pubdocs/K12SalaryAllocationPayforTeachersCertificatedInstructionalStaff.pdf, http://k12.wa.us/LegisGov/pubdocs/K12SalaryAllocationPayforTeachersCertificatedInstructionalStaff.pdf, http://www.k12.wa.us/Compensation/CompTechWorkGroupReport/CompTechWorkGroup.pdf, p. 20 (This is equivalent to $2.2 billion in 2017). Technical Report 15-024, Washington State 2014 Child Care Survey, Child Care Rate and Resources in Washington State, p. 39; (word document on DEL website), adjusted for inflation and the 2017 increase in the minimum wage. Childcare Aware of American, “Parents and the High cost of Child Care 2016,” http://usa.childcareaware.org/advocacy-public-policy/resources/research/costofcare/. This does not include any additional costs for employer FICA taxes, health care, paid vacation, or educational expenses.